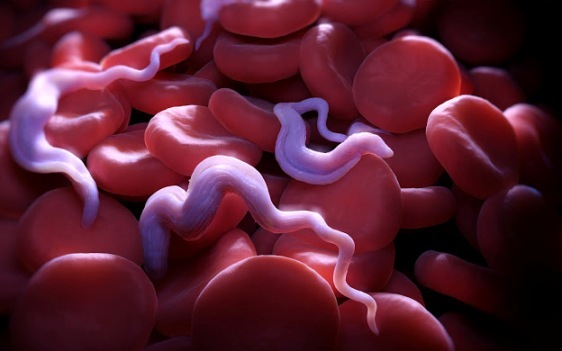 African Trypanosomiasis, also known as "sleeping sickness", is caused by microscopic parasites of the species Trypanosoma brucei. 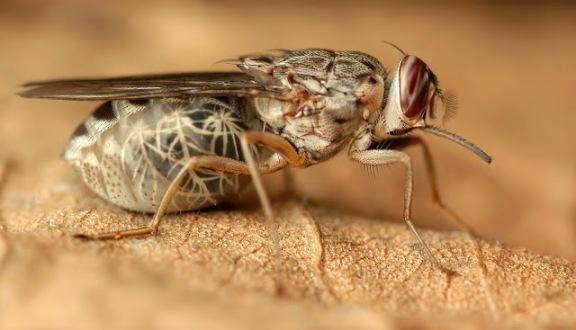 It is transmitted by the tse-tse fly (Glossina species), which is found only in rural Africa. Although the infection is not found in the United Kingdom or the United States, historically, it has been a serious public health problem in some regions of sub-Saharan Africa. Currently, about 10,000 new cases each year are reported to the World Health organization. However, it is believed that many cases go undiagnosed and unreported. Sleeping sickness is curable with medication, but is fatal if left untreated. First Stage: In the first stage, the parasite is found in the peripheral circulation, but it has not yet invaded the central nervous system. Second Stage: Once the parasite crosses the blood-brain barrier and infects the central nervous system, the disease enters the second stage. The subspecies that cause African trypanosomiasis have different rates of disease progression, and the clinical features depend on which form of the parasite (T. B. Rhodesiense or T. B. Gambiense) is causing the infection. However, infection with either form will eventually lead to coma and death if not treated. 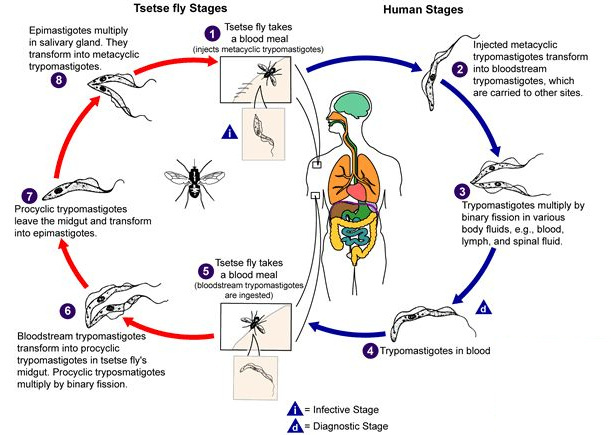 T. B. Rhodesiense infection (East African sleeping sickness) progresses rapidly. In some patients, a large sore (a chancre) will develop at the site of the tse-tse fly bite. Most patients develop fever, headache, muscle and joint aches, and enlarged lymph nodes within 1-2 weeks of the infective bite. Some people develop a rash. After a few weeks of infection, the parasite invades the central nervous system and eventually causes mental deterioration and other neurologic problems. Death ensues usually within months. T. B. Gambiense infection (West African sleeping sickness) progresses more slowly. At first, there may be only mild symptoms. Infected persons may have intermittent fevers, headaches, muscle and joint aches, and malaise. Itching of the skin, swollen lymph nodes, and weight loss can occur. Usually, after 1-2 years, there is evidence of central nervous system involvement, with personality changes, daytime sleepiness with night-time sleep disturbance, and progressive confusion. Other neurologic signs, such as partial paralysis or problems with balance or walking may occur, as well as hormonal imbalances. The course of untreated infection rarely lasts longer than 6-7 years and more often kills in about 3 years. The diagnosis of African Trypanosomiasis is made through laboratory methods, because the clinical features of infection are not sufficiently specific. The diagnosis rests on finding the parasite in body fluid or tissue by microscopy. The parasite load in T. B. Rhodesiense infection is substantially higher than the level in T. B. Gambiense infection. T. B. Rhodesiense parasites can easily be found in blood. They can also be found in lymph node fluid or in fluid or biopsy of a chancre. Serologic testing is not widely available and is not used in the diagnosis, since microscopic detection of the parasite is straightforward. The classic method for diagnosing T. B. Gambiense infection is by microscopic examination of lymph node aspirate, usually from a posterior cervical node. It is often difficult to detect T. B. Gambiense in blood. Concentration techniques and serial examinations are frequently needed. Serologic testing is available outside the U.S. for T. B. Gambiense; however, it normally is used for screening purposes only and the definitive diagnosis rests on microscopic observation of the parasite. All patients diagnosed with African trypanosomiasis must have their cerebrospinal fluid examined to determine whether there is involvement of the central nervous system, since the choice of treatment drug(s) will depend on the disease stage. The World Health Organization criteria for central nervous system involvement include increased protein in cerebrospinal fluid and a white cell count of more than 5. Trypanosomes can often be observed in cerebrospinal fluid in persons with second stage infection. All persons diagnosed with African Trypanosomiasis should receive treatment. The specific drug and treatment course will depend on the type of infection (T. B. Gambiense or T. B. Rhodesiense) and the disease stage (i.e. whether the central nervous system has been invaded by the parasite). Pentamidine, which is the recommended drug for first stage T. B. Gambiense infection, is widely available. The other drugs (suramin, melarsoprol, eflornithine, and nifurtimox) used to treat African trypanosomiasis are also available. There is no test of cure for African trypanosomiasis. After treatment patients need to have serial examinations of their cerebrospinal fluid for 2 years, so that relapse can be detected if it occurs.